One of President George W. Bush’s priorities has been the expansion of the controversial school voucher program, which ostensibly gives children who attend failing public schools the ability to obtain a better, private education elsewhere. Denounced by its opponents as a thinly disguised attempt to fund parochial schools, the voucher program has become a flash point for anger over public education in general and for how students are being educationally shortchanged. In a fascinating overview of this roiling controversy, Barry Lynn of America’s United for Separation of Church and State and Clint Bolick of the Institute for Justice debate the merits of school vouchers in the audio component of this innovative book-and-CD set. Originally aired on National Public Radio as part of the Justice Talking series, the recorded debate is presented here in its entirety. An accompanying book includes a complete transcription along with a summary of the pro and con arguments, both legal and educational, and a range of relevant primary source materials. 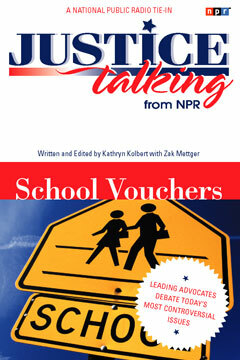 An incomparable guide to a cutting-edge debate, Justice Talking: School Vouchers offers a road map for parents, teachers, community leaders, and others to a complicated yet crucial issue. Zak Mettger is the author of two juvenile books on the Civil War and the co-author of Who Killed George Polk?